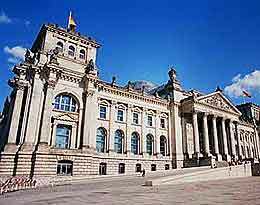 Berlin attraction-guides.com - Berlin, Germany attractions guide Berlin Reichstag (Parliament Building) information about attractions, German parliament (Bundestag), Reichstag in Berlin Area, Germany DE, Christo art, Russian troops, history, location and address, Platz der Republik 1, Berlin-Tiergarten, tel / telephone number, and general tourist information about Reichstag (Parliament Building) attraction in Berlin area, Germany DE Deutschland - Last updated 30/10/2012. The Reichstag was built in the late 19th century to house the German parliament (Bundestag), but was set on fire in 1933, supposedly by Nazi supporters, bombed by the Allies during WW II and also stormed by Russian troops in 1945. Visitors can see that there is even traces of the graffiti that the Russians left behind. After recently undergoing some renovations, the Reichstag is once again home to the united German parliament, for the first time since 1933. One one of the strangest things ever to happen to the Reichstag building was in 1995, when conceptual artist Christo and his wife Jeanne-Claude draped the whole building up in 100,000 metres / 328,000 feet of shiny, grey polypropylene and tied it with a deep blue rope. This unusual work of art lasted for just a few weeks during the summer and the project involved many hundreds people at a cost of around USD 9 million.